The general target of 10,000 steps per week is based on the theory that the average person will burn 3500 calories when they walk 10,000 steps and lose a pound of fat. You may have read someplace that it is 10,000 steps a day, and although you could walk 10,000 steps in a day and some do. 10,000 steps is about 5 miles and would take about 100 minutes. Those numbers are average, go here to calculate the number of steps you take in a mile. The most common 10,000 steps challenge is based on adding 10,000 steps to what you already do now to benefit from the additional exercise. Burning calories just like consuming calories is a cumulative thing. That means you can add up your progress over time. Assuming you have started your fitness walking goal to begin with accomplishing an additional 10,000 steps per week you may initially plan to walk 1500 steps each day (takes the average of 10 min for 1000 steps walking at a moderate pace) but something comes up and Tuesday you have no time to walk. By having a step counter pedometer and a firm goal of 10,000 steps by end week you can do an extra 500 steps for the following three days and still benefit at the end of the week by losing the full pound. Having said that it is the better choice to even out your workouts and nutrition. But stuff happens in life and this is an effective way of maintaining your goals. Beginning your fitness and weight loss goal with walking 10,000 steps is great because it teaches you goal setting, journaling and is a great way to feel good about what you are doing because it is easy to measure and record, and absolutely produces positive results. 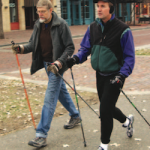 If you find it difficult to walk for any length of time due to obligations or health. It is perfectly fine to walk for just 3 min or 5 min or what ever you can do. 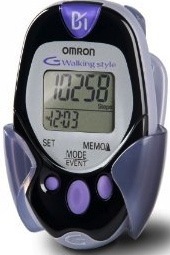 With the pedometer recording 10000 steps, you can watch how doing short walks will still add up. 10000 steps weight loss is achieved over the week whether you go for 30 minutes at a time or go for six, 5 minute walks. Its all good really. Don’t forget you are moving throughout the day already. It’s a good idea to get a baseline of your average activity so when you first get your pedometer wear it all day, everyday for awhile. You may be surprised to find out how much more you are walking – or how much less you are walking than you had originally thought. The more aware you are of yourself and your habits, the more prepared you are when you are making positive changes toward your health. Knowing this you can more effectively make a 10000 steps program that is specifically designed for you and your needs. As you progress in your walking fitness regime you may find that you want to do more. If you are planning on exercising for more than 30 minutes you should make sure you are dressing appropriately and have water. 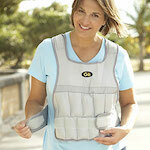 I will re-state what I said over on Walking for Weight Loss you do not need any special equipment. But now that you find you are heading our for an hour or more – congratulations – you have become a seasoned walker and need to adjust accordingly. You may want to look at getting some pieces of walking equipment. Take water, dress in layers and keep a journal. Novice or advanced walkers need to be seen so wear bright and reflective clothing and face traffic if you have to walk on the road. Go here for more Walking for Fitness Tips. Its going to hurt sometimes. Don’t be afraid of some muscle pain – you can read about Delayed Onset Muscle Soreness or DOMS here. Make sure you are doing warmups and a full stretching routine after, you will quickly adapt to your new walking fitness routine. If you want to know what really hurts, walk a couple of miles on a sandy beach in your bare feet. Your calf’s will be like tight, angry, little golf balls the next day. 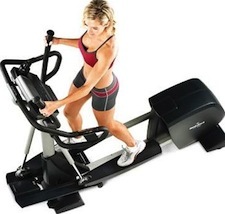 But a really great workout for your legs and increased caloric expenditure over the same distance and time.